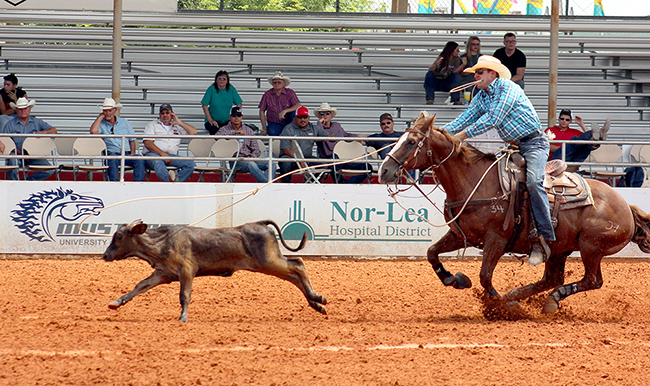 Tie-down roper Clint Cooper, who grew up in Lovington, N.M., competes during the 2015 Lea County Fair and Rodeo in his hometown. The rodeo has been recognized as one of the best in the PRCA. LOVINGTON, N.M. – Not many people outside this region know of Lovington, nor do they understand much about the community of hard-working folks. ProRodeo cowboys and cowgirls do, and they look forward to arriving every summer for the Lea County Fair and Rodeo, set for 7:30 p.m. Wednesday, Aug. 10-Saturday, Aug. 13, at Jake McClure Arena. The rodeo is a major stop for the contestants with big money, a historic past and some of the best hospitality they receive on the rodeo trail all year. That’s why Lovington’s rodeo is regularly recognized as one of the best events in the Professional Rodeo Cowboys Association. Over the past few seasons, it has been nominated for the PRCA’s Large Outdoor Rodeo of the Year. He’s been part of it for a long time, first as a fairgoer, then a contestant. It’s in that role that he understands most what an honor it is for the local rodeo to be recognized as one of the top 20 rodeos in the country, the top five in its division. So does Corey Helton, the fair board’s chairman. The list is powerful in the rodeo world and includes other historic events in Pendleton, Ore.; Cheyenne, Wyo. ; Ogden, Utah; and Salinas, Calif. Like Lea County, all those events offer lucrative purses and outstanding competition. Likely the most recognized is the Cheyenne Frontier Days Rodeo, which takes place two weeks prior to Lovington’s. Since the award’s inception in 1993, Cheyenne has earned the title 16 times. Pendleton earned the honor in 2015. “This is a really big deal, especially with me having a rodeo background,” said Burns, a two-time qualifier to the National Finals Steer Roping. “I’ve seen most of the rodeos in the western United States, and for me to be part of the production team and the volunteers that are putting this production together is a notch on my board. The rodeo has been on the landscape of the Plains for better than 80 years. The history of Lea County includes Jake McClure and Troy Fort and an entire clan of Coopers, just to name a few. Not only are they part of the local history, they are part of rodeo history. The tradition and legacy of rodeo in this neck of the woods is as strong as ever.